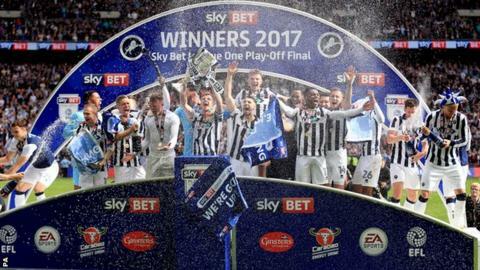 Steve Morison volleyed a late winner as Millwall won promotion to the Championship with victory over Bradford in the League One play-off final. Bradford controlled the first half, Jordan Archer saving well to stop Billy Clarke giving them the lead at Wembley. Millwall improved and Jed Wallace dragged a shot wide when put through. But Morison stabbed in Lee Gregory's header to send Millwall to the second tier after two years away, with Lions fans invading the pitch at full-time. Tony McMahon had Bradford's best chance to equalise in stoppage time, but the full-back could only fire wide from a tight angle. Millwall fans flooded on to the pitch at the final whistle, but although a small number of supporters confronted Bradford's dejected players there did not appear to be signs of serious trouble. Those scenes could do nothing to dampen the Lions' players spirits, however, as they laid to rest their demons from play-off final defeat by Barnsley a year ago. Bradford were aiming to return to the Championship for the first time since suffering relegation in 2004, and they looked well set to do so after a dominant first-half showing. Clarke and Mark Marshall were particularly influential, regularly finding space in between Millwall's defence and midfield. But the Bantams were punished for poor decisions and the lack of a final ball, with Clarke's chance their only real opportunity. Marshall broke free down the left on a counter-attack, and weighted his through ball perfectly into the path of Clarke. But Archer - who conceded twice in 20 minutes in Millwall's defeat by Barnsley at Wembley last season - made a wonderful save to his left to turn the ball behind. Millwall made a similarly slow start to this year's final, but this time Archer and his defence held firm against waves of pressure. Neil Harris' side emerged a different team after the break, with Wallace inches away from handing his side the lead after being played through by Gregory. Bradford offered less of a threat as the game went on, and Millwall's direct approach finally paid dividends inside the final 10 minutes. Wallace's cross from the left was flicked on brilliantly by Gregory, with Morison holding off James Meredith at the back post to secure his side a place in the Championship. Match ends, Bradford City 0, Millwall 1. Second Half ends, Bradford City 0, Millwall 1. Attempt missed. Tony McMahon (Bradford City) right footed shot from a difficult angle on the right is close, but misses the top right corner. Assisted by Josh Cullen. Foul by Josh Cullen (Bradford City). Romain Vincelot (Bradford City) wins a free kick in the defensive half. Offside, Millwall. Nadjim Abdou tries a through ball, but Fred Onyedinma is caught offside. Substitution, Millwall. Callum Butcher replaces Lee Gregory. Substitution, Millwall. Fred Onyedinma replaces Jed Wallace. Attempt missed. Josh Cullen (Bradford City) right footed shot from outside the box is too high. Assisted by Timothee Dieng following a corner. Corner, Bradford City. Conceded by Shaun Williams. Goal! Bradford City 0, Millwall 1. Steve Morison (Millwall) right footed shot from very close range to the high centre of the goal. Assisted by Lee Gregory with a headed pass. Colin Doyle (Bradford City) wins a free kick in the defensive half. Corner, Millwall. Conceded by James Meredith. Foul by Charlie Wyke (Bradford City). Tony Craig (Millwall) wins a free kick in the defensive half. Attempt missed. James Meredith (Bradford City) header from the centre of the box misses to the right. Assisted by Tony McMahon with a cross. Attempt missed. Jed Wallace (Millwall) header from the centre of the box is too high. Assisted by Shane Ferguson with a cross. Nathaniel Knight-Percival (Bradford City) wins a free kick in the defensive half. Corner, Millwall. Conceded by Rory McArdle. Attempt blocked. Steve Morison (Millwall) right footed shot from the centre of the box is blocked. Assisted by Jed Wallace. Offside, Millwall. Mahlon Romeo tries a through ball, but Steve Morison is caught offside. James Meredith (Bradford City) is shown the yellow card for a bad foul. Jed Wallace (Millwall) wins a free kick on the right wing. Attempt saved. Shaun Hutchinson (Millwall) header from the left side of the box is saved in the bottom left corner. Assisted by Shane Ferguson with a cross. Corner, Millwall. Conceded by Josh Cullen. Substitution, Bradford City. Timothee Dieng replaces Nicky Law. Substitution, Bradford City. Alex Jones replaces Billy Clarke. Offside, Bradford City. James Meredith tries a through ball, but Mark Marshall is caught offside. Substitution, Millwall. Shane Ferguson replaces Aiden O'Brien. Billy Clarke (Bradford City) wins a free kick in the defensive half.